Sign up to receive SOCP® News and Events. Special Operations Combatives Program (SOCP) Level Two Course April 15-26, 2019. On 23 March, 2010, SOCP® historically became the first Combatives Program officially designated for all U.S. Army Special Operations Forces. This is a significant milestone which directly enhances the fighting qualities of our current and future special operations personnel . 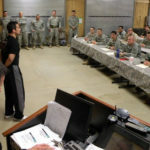 What this serves to do is to ensure that there will always be a combatives program for the special operator uniquely attuned to his changing requirements based on todays missions downrange as well as those in the future. Historically combatives training in the U.S. Army has suffered from the lack of an established training program. And this has also been the case in the Special Operations community. Acceptance of SOCP® is recognition by the Special Operations senior command that a mission-specific combatives capability is one of the core skill sets needed by the special operator to effectively carry out his demanding assignments. We can credit the terrorist attack against this country on 11 September, 2001, and the declaration by the U.S. of a Global War on Terror as the catalyst responsible for the growth and development of SOCP®. U.S. Army Special Operations Forces were tasked with targeting the terrorists critical infrastructure, those significant field commanders and the technical and support specialists within the terrorist networks, now designated as High Value Targets (HVT). Thus SOCP® developed as a Combatives Program designed as such a program must be but often is not. It developed from the field up, not from the instructor down. This approach continues to be in use today. In 2008 SOCP® was adopted as the official Combatives Training Program at Range 37 for operators with the HVT mission; the primary SF instructor for SOCP® was Sergeant First Class (now Master Sergeant) Carl Haskins. In 2009 MACP adopted SOCP®�s Post-Frame-Hook and standing and ground. Adopted in 2010 as the official Combatives training program for the U.S. Army�s Special Operations Forces; the first SOCP® course of record was taught to the class beginning 26 March 2010. On 7-8 June 2010 MACP instructors were trained in SOCP® basic cuffing; the SOCP® cuffing techniques and vehicle extraction procedure will be added to the MACP programs. September 2011 Victor F. Vellon USAJFKSWCS, DOTD, TDD Branch 2, Advanced Skills formatted Greg's written techniques to an official format and the first SOCP® POI was approved and signed. 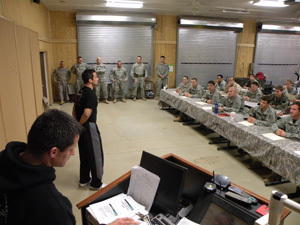 JUNE 2012 Air force Para Rescue/SERE ran their 1st Instructors' Course and committed to spead ing SOCP® throughout the Air Force Special Operations Community. Swedish Army Combative Instructor Chief Lt. Rickard Gustafsson , and Navy MARSOC Instructor were in attendance and committed to spread SOCP® to their Communities. October , 2012 Air Force approved 1st official formatted SOCP POI. It was formatted by SERE Instructor SrA. Anthony Fischer using Greg Thompson's Techniques and Guidance. 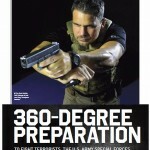 The State of Washington SERE Instructors are teaching SOCP monthly. Master Sergeant Haskins was to prove himself to be one of the primary forces in the development of the SOCP® program for the HVT operators. His combat experiences during HVT operations gave him the ability to quickly determine what was going to work and what was not in high threat situations. In addition he was an experienced combatives instructor as. As a senior SF NCO with these qualifications, he led by example, setting the performance standards for the students he was responsible for. He knew all too well that there were no second place winners in these operations and would accept no less than their very best. Greg makes it a point to tell each SOCP® class that the program would not be where it is today without the professionalism, experience, communication, tireless drive, and support that Master Sergeant Haskins has provided. Also worthy of special mention is the critical importance of the "prisoner handling module" in the training for the HVT operator. As an intelligence source the HVT is without equal and must be treated with this in mind. Without proper training, this is an area that is especially vulnerable to the use of excessive force. SOCP® recognizes this and teaches techniques that address each prisoner handling sub-set, i.e., handcuffing, searching and transporting. Handcuffing a resisting subject with flex cuffs is the centerpiece of this module and the techniques SOCP® has developed have been adopted Army-wide. One of Greg's current projects is the development of his edged weapons program. From his continuous debriefings of operators returning from the field he has learned that at least 50 percent of all knife injuries sustained by our soldiers in Iraq and Afghanistan are caused by an insurgent who gains control of the soldier's knife. Accordingly Greg determined that an edged weapons awareness program was needed. This program will use actual footage of knife attack incidents which he is in the process of collecting from around the world. In summary, the SOCP® owes its continuing success in meeting "the unique needs of the modern day Special Operations soldier" to several contributing factors. To understand the importance of a combative program for the HVT operator, one must understand the characteristics of the HVT operation itself. This is an extremely high-risk undertaking driven by actionable intelligence which is by nature, highly perishable. Consequently this frequently results in an operation that must be quickly launched with minimal preparation time. Regardless the operation must be conducted with surgical precision and control. So Greg Thompson and SOCP® must be recognized as major factors in the success of this program. As the primary instructor and course developer for SOCP®, the combatives training for the operators who will undertake these HVT missions, missions which have saved countless lives by disrupting terrorist attacks, Greg must be considered as a major resource. He is not only an experienced professional MMA fighter with an impressive knowledge of a variety of fighting skills, he is also an articulate, passionate, tireless instructor. This combination of capabilities uniquely qualifies Greg to direct SOCP®. Developing a continuous feedback loop with the operator has given him a clear perspective of their operational realities which serves to guide him in the design and development of the specific skills which the operator needs in order to better perform this complex mission. The SOCP® instructor program needs to be recognized here as an indispensable component which facilitates getting the needed training as well as changes to the training to the end-user in a timely fashion. SOCP® is a constantly evolving work-in-progress is another key to its success. Finally, official acceptance of SOCP®, while it has been a long time in coming, is fitting recognition that the U.S. Army's Special Operations Forces deserve no less if we are to keep them America's best in time of war as well as during peacetime.